Representative Example: Amount of credit: £500. Interest rate: 0.8% per day for up to 40 days (292% per annum (variable)). Representative 68.7% APR (variable). Requirements to apply: you must be at least 18 years old, be a UK resident with a UK bank account, have an active debit card, a mobile number and an e-mail address. You also need to have a regular monthly income. SafetyNetCredit offers an alternative way to borrow money with their revolving credit line of £1 up to £500 (£1000 for existing customers), subject to affordability checks. Apply once and, if approved, get a running credit account with ongoing access. 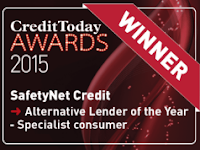 SafetyNetCredit is regulated by the FCA and committed to transparency and responsible lending. You can borrow £1 to £500 as a first time borrower, for up to 40 days. Their fees are straight forward as they charge 80p per day per £100 you borrow. For example, if you borrow £200, you will pay an interest of £11.20 per week. However, you will never repay more than £264 in total, no matter how long you borrow since the interest is capped at £64.00. Reviews on TrustPilot are quite compelling with an average grade of 9.2 out of over 2,500 reviews published. Among this total, 81.2% graded the lender 5 stars. The application is straightforward, all charges are transparent and there are no additional or hidden fees. You decide how and when to use your account and can expect outstanding customer service. During the process, they will run a credit check and you will need to share your online banking login details. Why do they need this information? to help you avoid going into unauthorised overdraft: SafetyNetCredit will monitor your transaction and if your balance drops to a pre-agreed level, they will automatically fund your account so you avoid going into unauthorised overdraft. You can choose to repay anytime for any amount from your SafetyNet dashboard on their website or mobile application. 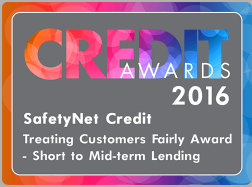 Besides the regular lending services, SafetyNetCredit offers some money management tools via their website and apps. At any time you can login your account and see from your dashboard how much credit is available to you. You can also see how much you owe them. Interactive graphs and personalised dashboards will help you track and analyse your spending habits and manage your budget more efficiently. All your spending is categorised and pie-charted so that you understand in a glimpse where you have been spending your money. A convenient service that can avoid you unauthorised overdraft fees is the automatic top up that you can easily set with your account. Legal Disclaimer: Allpaydaylenders.com is an introducer (or broker) that gives independent ranking and reviews on loan lenders and loan companies. They are only intended for informational use and do not constitute professional advice. We strive to keep the information presented up to date but do not guarantee that it is free of errors. Please always refer to the Terms and Conditions on the lender's site. We do not accept liability for any errors nor omissions on this website. This website is privately owned and contains links to direct payday loan lender websites that chose to advertise with us and pay us in return for doing so. We take no responsibility of the content on websites that we link to. We are not a lender and do not provide credit to consumers. If you make an application through this website it will be shown to a selection of our lending partners for their consideration.